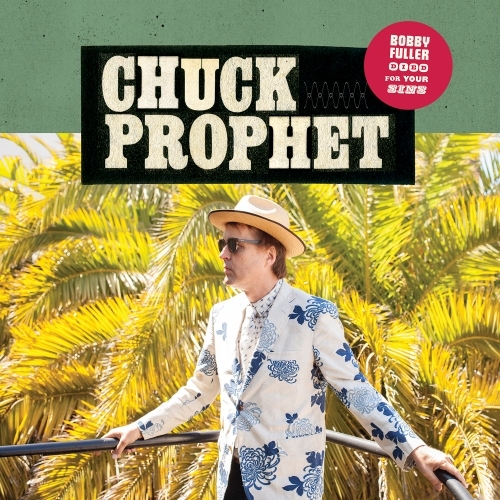 The sun always shines on Chuck Prophet, the album cover of his new album seems to suggest. It may well be judging from the quality of his latest, 13th solo output. The songs seem to pour from him without effort. Last year his former Green On Red bandmate Dan Stuart released a great rock record with a bunch of young Mexicans. Prophet stays closer to home and releases a record that is completely in line with what the world expects from him. Smooth running songs between alternative rock light, pop and Americana Chuck Prophet style. The easy way out is just to write that Prophet delivers in a pleasant way. He comes with an album that holds all things Chuck Prophet. Usually that does it for me since somewhere in the late 90s. I have not heard all albums as sometimes one slips through. This one hasn't, thanks to another upcoming show in Q-Bus, Leiden, where I've seen Chuck Prophet play with loads of pleasure oozing of the stage. The first time the jetlag was apparent yet that did not diminish the enthusiasm one bit. So come 2017 and here is Bobby Fuller Died For Your Sins. What a blasphemous title! Well, "Jesus died for somebody's sins, not mine", to quote Patti Smith. Bobby Fuller? There's this one song I know, 'I Fought The Law', but that's about it. Googling the man, I found out that he died over 50 years ago and had never heard that before. Apparently a suicide, although there are several theories claiming differently. So there he was in his car, suffocating from the fumes, for us. Further down the album Jesus does appear as a social drinker and what not. Quite a humorous song. Now the song could be about any American of Latin American descent. Where in north western Europe no one is called Jesus, it's normal in more southern, Spanish languaged climes. But my guess it is about THE Jesus. So the title song and this song are nice trade offs, tongue-in-cheek. 'Jesus Was A Social Drinker' is also one of the songs where things explode in a great way. The drummer kicks up a storm for the band to follow, taking the song in a total different, punky rock direction. Something I don't associate with Chuck Prophet. So here's a nice surprise that will work a miracle live. Something that happens again later on in the album again, when the band rocks full on in 'Alex Nieto', ZZ Top style. By then the album is almost over and it's easy to forget a great song like 'Your Skin', which rocks a little less loud, but is menacing in the nicest way possible. They are nice rocking outings, but Chuck Prophet's forte is in the slower regiment, mind, this does not necessarily equal a ballad, where the music accompanies a short story or observation. Without ever making the music subordinate to the lyric. Always there are these pleasant melodies. Not unlike Ray Davies of The Kinks in 'Open Up Your Heart' and 'We Got Up And Played', which reminds me of 'Don't Forget To Dance'. Both touch on this melancholy mood in music and lyrics. Having made this statement, Bobby Fuller ... is not a slow-paced album. Chuck Prophet is mostly in a rocking mode and I like it. A lot. This record is growing by the spin. New treasures being revealed each time. There is one song where I thought to listen to a cover. 'Bad Year For Rock And Roll', in the chorus reminded me of Admiral Freebee's song with the same title, which I only heard from a stage, twice. Looking the song up, I was rest assured, the songs just cover the same title and a slight similarity in the title phrase, that's all. So let this one be a tribute to 'the thin white duke'. On Bobby Fuller Died For Your Sins Chuck Prophet successfully places himself in different musical styles and moods. From the driven title song, to beautiful ballads and a fierce rocker. He is able to give his music something hard-edged or make it soft as butter where that knife can just slide through without any hindrance. At both he is extremely adept, making Bobby Fuller Died For Your Sins an ideal Chuck Prophet album, right up there with my favourite ones, 'No Other Love' and 'Let Freedom Ring'. It's time to catch on 'Night Surfer', one I missed in 2014.